You will feel a certain amount of discomfort during the treatment, but this varies greatly on your tolerance and pain threshold. 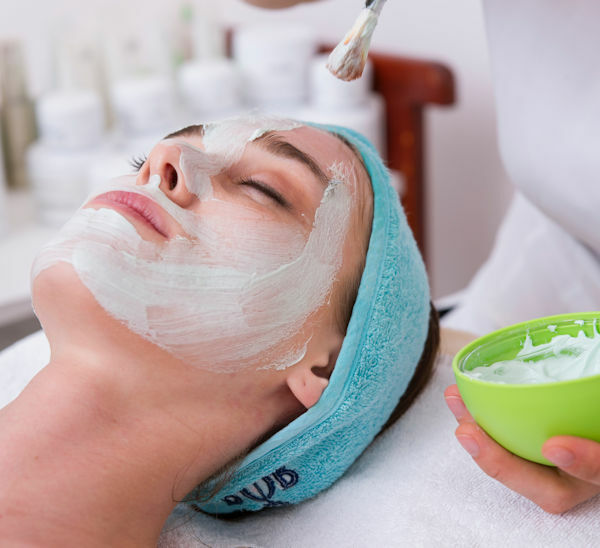 A facial which includes massage of the shoulder, neck and face is a very relaxing treatment. The treatment takes approximately one hour. You will feel rejuvinated and refreshed afterwards. In the event of blackheads the face can be steamed to help ease the blackhead removal. Whilst having the facial clients hands receive a deep nourishing treatment. Make-Ups to suit all occasions, weddings, first communions, confirmations, graduations parties etc. Eye lash tinting and brow tinting can give colour to fair hair and more definition to the eye area. This treatment is especially beneficial for people who are going on holiday or who swim a lot and do not want to use waterproof mascara. Lash tinting can last for 4 to 6 weeks, brow tinting a little less. Waxing is a method of temporary hair removal, which removes the hairs from the root. This can last for a period of 2 to 6 weeks, depending how often the treatment is done, the rate of hair growth and how strong the hairs are. The hairs need to be approximately a quarter inch or half cm long for the wax to stick to the hairs for a successful treatment. This is a physical process of hair removal and you may experience mild discomfort when the wax is removed. This is a normal sensation in this treatment. For Beauty Eye Treatments and Waxing Treatments it is professional practice that prior to the first treatment a patch test is performed to ensure that you will not have any adverse reaction the the treatment. The patch test is done on a small area of the skin. If no reaction has occurred within 48 hours it is safe to proceed with a full treatment.